Place mixture/bowl in the refrigerator for 30 minutes. Place back in the refrigerator and allow to "set" for one hour. Transfer to an air tight container and place back in refrigerator. A special thank you to Eat Live Run for the inspiration to make these! I have decided to step outside of my comfort zone and embrace cooking with quinoa. With all of the buzz on the health benefits of quinoa, I'm surprised I haven't used it before now. 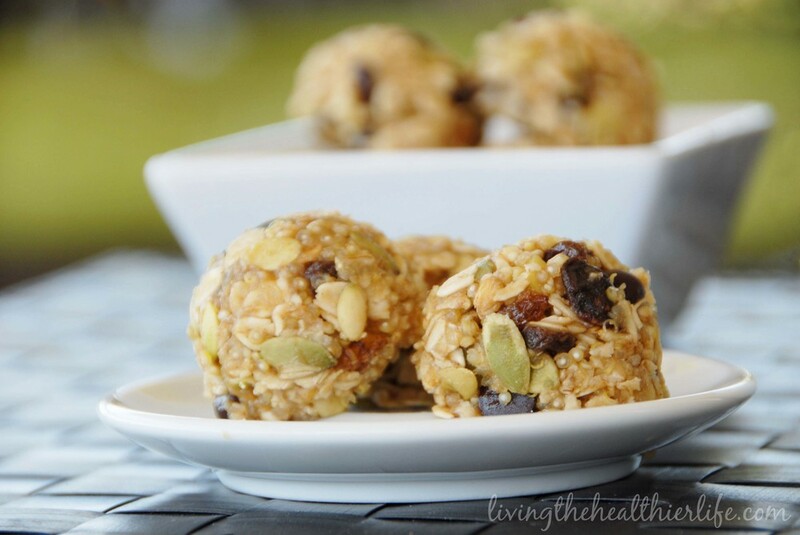 My first venture was these super easy, Quinoa No-Bake Trail Mix Balls. A combination of sweet and salty held together by all natural peanut butter and honey glue, these bite-sized treats are quickly becoming a favorite with the kids (little man actually bypassed the M&M cookies in favor of these). A quick note: I made these this morning and after 30 minutes, they still were not rolling well. I believe this is because it is very humid out today (it is about to rain), so if you find that they aren't holding together well, you may leave them in the fridge for 10 or 15 minutes longer (which worked for me). Also, I'm going to change the recipe to reflect using a tablespoon measuring spoon as opposed to a cookie scoop. The scoop tends to get hung up in the oats and it creates a mess. Also, make sure you keep the tablespoon wet to ensure that the mixture doesn't start sticking to the spoon. And finally... using a tablespoon instead of the cookie scoop drastically improved the amount of balls you can make out of one batch, so I have updated the nutritional info to reflect this.